I really wanted to be able to recommend 101 Tokyo, but the prices for beers and the food push it into the realm of needing a second mortgage to be able to have more than four or five beers with some food. Moreover, the peculiar table charge system ticked me off as well – sit at a table after 5pm then pay an extra ¥500, while sitting at the counter means no other charges are incurred. It ticked most of the boxes I look for – it’s open early, has a decent range of beers on tap, the staff are friendly, and there is free WiFi – and the atmosphere is warm and charming. I guess if you’re looking to impress someone i.e a date, then bring them to 101 Tokyo, else find somewhere where your yen stretches a bit further. The gentrification of Ebisu has been happening for a while now – new department stores coming up, old stores being knocked down for some new buildings, and craft beer bars, along with coffee shops, opening up too. 101 Tokyo is the latest to open, at the time of writing, with it springing up in August 2018 near the intersection to walk to either Shibuya or Hiroo. It is styled as being a Mexican restaurant but that couldn’t be farther from the truth. It’s about a five minute walk from Ebisu station, located on the Yamanote Line, Saikyo Line, and Shonan-Shinjuku Line, but also accessible from the Tokyo Metro Hibiya Line too. From the outside, 101 Tokyo looks rather upmarket for a Mexican restaurant, with its wood panelling, high leather chairs and tables, and DJ desk poking out. Get inside, and it’s clear that it’s more a fashionable bar with Mexican food, as well as curry, tacked on, but more about that later. There is space for about 30 people in 101 Tokyo – dotted around tables and counter seats. If you sit at a table, then you will incur a ¥500 table charge after 5pm, but the counter section, which opened in November 2018, does not carry a charge. The inside of 101 Tokyo is non-smoking, though there is a small smoking booth somewhere inside but I couldn’t find it, or smell it. There is also free Wifi too, though you do have to ask the bar staff for the details. 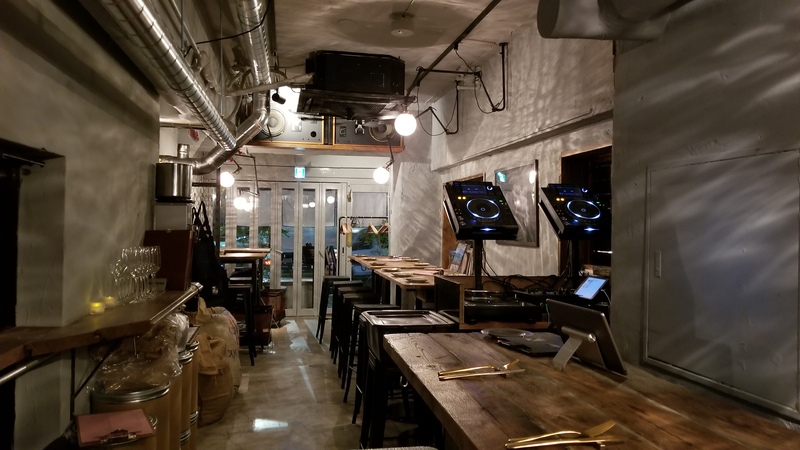 There are twelve taps of beer on at 101 Tokyo, with one of those dedicated to a domestic macro beer (Ebisu, natch), and the rest being split between imports and domestic. The prices are on the expensive side for Tokyo, let alone Japan. The beers come in three sizes: small (230ml) from ¥600 to ¥800, medium (330ml) from ¥800 to ¥1,000, and large (480ml) from ¥1,000 to ¥1,200. Thankfully those prices include tax, as I wouldn’t have gone in to have one beer, let alone three. There is also a four beer tasting flight of 100ml glasses for ¥1,600 – which is more expensive than ordering just one large beer on the menu. There’s no happy hour either, so don’t go in expecting something cheap after work. The food – or what I was promised – wasn’t on. Literally they were not making it the day I went. It would have been nice to have been told that there were no lamb and cumin tacos, so instead I plumped for what could only be described as the saddest bowl of guacamole and tortilla chips I’ve ever seen. Thankfully, they tasted amazing and, in a weird twist of fate, there was too much guacamole for the dish. There is also curry on at 101 Tokyo, so next time I go, there will be pics of that. The closest station to 101 Tokyo is Ebisu station, located on the Yamanote Line, Saikyo Line, and Shonan-Shinjuku Line, but also accessible from the Tokyo Metro Hibiya Line too.